A rainy weekend cooled temperatures a bit, and I managed to make chicken & sausage gumbo…but I didn’t get any good photos. 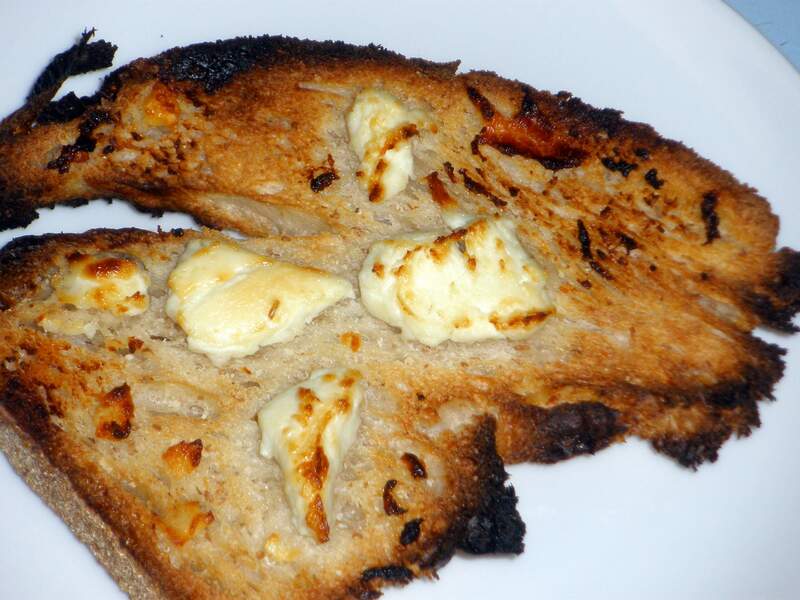 So I offer you a picture of the thing I eat most often: cheese toast. Why toast? ‘Cause frequent baking means I have a freezer full of bread, and frozen bread is happiest when toasted. Cheese plus bread: I could live happily on just those two things. If the bread is homemade sourdough and the cheese is fresh chevre, so much the better. When I read about Americans eating Applebees and Panera because they’re “too busy to cook”, I wonder if they’ve all forgotten how to make cheese toast and salad. Read more about my eternal meal companions, cheese and bread: pickles and gruyere on pain au levain, or homemade pimento cheese, or cheddar on sourdough. My momma’s cheese toast never looked this good. Growing up in the late 60’s early 70’s, ours was always just white bread, cheddar cheese and an ungodly amount of butter. Wow, just that thought of it makes me nostalgic. But these days, I’d MUCH rather have yours. Nothing wrong with American on white….as long as you add some hot sauce, or sliced dill pickles, or a fresh sliced tomato.